In the Spring of 2012, I had volunteered to make a bed-sized quilt for a fundraiser for a private school in Napa, CA. The Napa Valley is a prime wine grape growing area and also is well-known for the hot air balloons that let people see the valley from that very unique perspective. 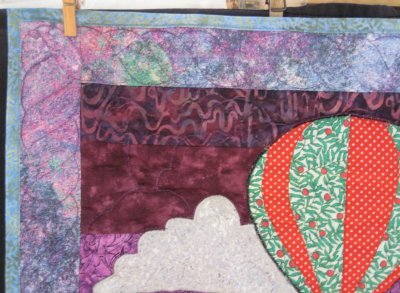 The fund raiser quilt featured both of those subjects: grapes and hot air balloons. Whilst I was making the fund raiser quilt, Mr. Pirate mentioned that another one of his cousins actually worked for a hot air balloon company in Napa Valley and would I make her a hot air balloon quilt too? Well, you could have blown me over with a feather. Mr. Pirate *never* .. or had never .. asked for a quilted anything for anyone before. Of course, I would accomodate his request! And while I had no problem with making a bed-sized quilt for the fund raiser, I *did* tell Mr. Pirate that I was extremely reluctant to make a bed quilt for a person that 1) we really didn't know 2) had no idea if she even LIKED bed quilts 3) would appreciate a custom made one 4) had absolutely NO idea what colors she liked or the color scheme of her bedroom. Mr. Pirate also knew how much time (and resources!) were involved when I make a quilt, so he agreed that perhaps a bed-sized quilt wasn't the best idea. However, when I suggested a quilted wall-hanging, he agreed that seemed a great solution to all of the mentioned drawbacks of a quilt. 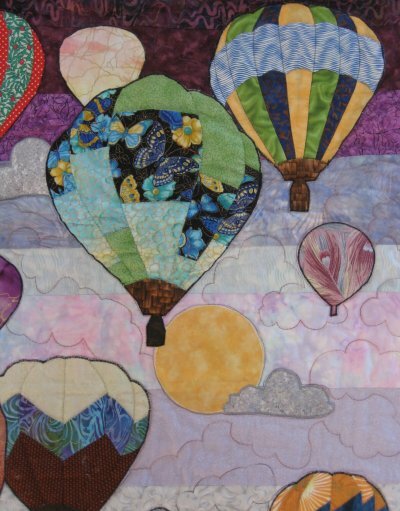 Under normal circumstances, my first thought would be to hand applique the hot air balloons using needle-turn applique. Since I learned a needle-turn technique that works for me, I have truly enjoying doing hand applique. But, this wall-hanging was for a person that we *just don't know*. Not to be a snob or anything, I just did not want to put a LOT of labor-intensive sewing into this piece because I had no idea if the recipient would appreciate it. So, this was one of the few times where I used fusible appliques and zig-zagged the raw edges. Honest to goodness, I felt like I was cheating. The background for this wall-hanging is really nice! Barbara Jones has you build a strata of evening sunset colors, ranging from pale lavendar at the horizon to deep purple at the zenith. The ground was a patchwork of different shades of green, to represent the vineyards below. Not having worked on too many wall-hangings before, I found this technique to create an interesting background to be simply fantastic. It was fast, it was easy and it looked terrific. 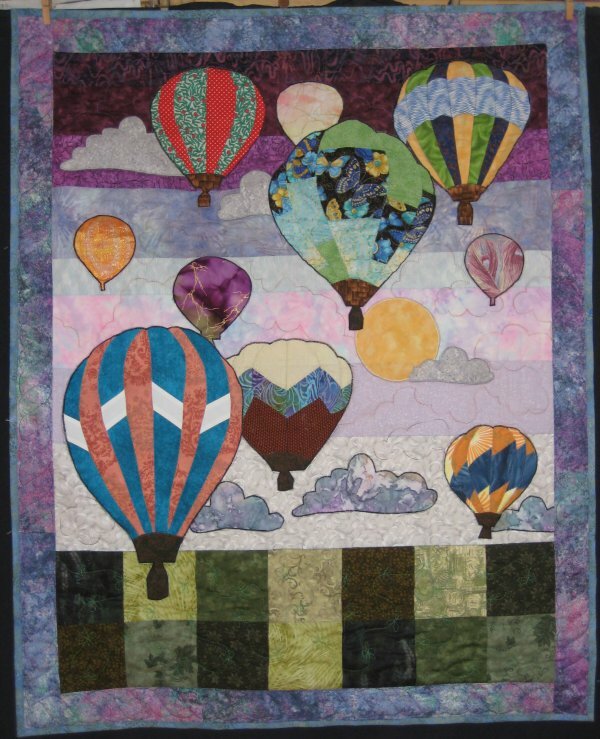 The hot air balloons were created by strip-piecing some of the stripes and then fusing those stripes to the base fabric of the balloon. The entire balloon was then also fused to the background fabric. One piece fabric balloons ... and the clouds ... were simply fused in place. All raw edges were narrowly zig-zagged with a satin stitch. As a result of the fusible process, this small wall-hanging was completed in a very short order. This really was a very satisfying project! The quilting was fairly minimal. I did a stitch in the ditch around all the balloons and all the balloon stripes. I free-motioned clouds in the strata background and did an embellished meander in the vineyard area, using one of Darlene Epps' designs from her "Pocket Guide to Free-handing" books. 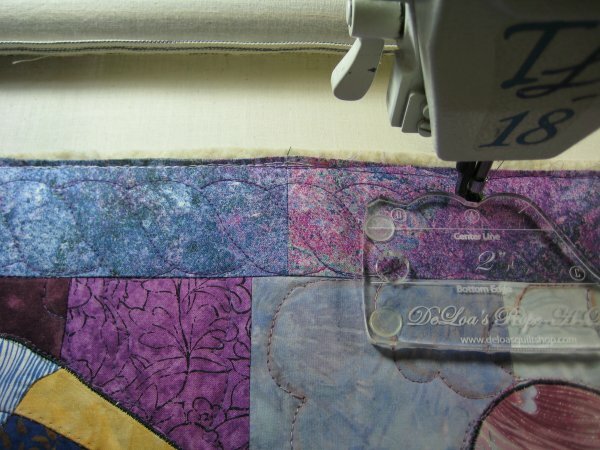 At some time in the past, I had purchased Deloa Jones' "Rope a Dope", which is a fantastic template to stitch a single cable design. She makes it just SO easy. She even has directions on how to turn the corner gracefully. Although I didn't keep notes on how long it took to quilt, I can tell you, it wasn't very long. Because Mr. Pirate doesn't know this cousin that well and we don't interact with her socially, we needed to invent a reason we could meet up with her that wouldn't be totally suspicious. It turned out that she ... and some other mutual relations and friends ... go biking some evenings. Afterwards, some of them go out to dinner. It was during the time between the end of the bike ride and the drive to dinner, that *we* insinuated ourselves into the gathering. Although the circumstances were a little out-of-ordinary, because there *were* other relatives and mutual friends there, our presence wasn't totally off-the-wall. So, the entire project turned out extremely well. And I'm very happy for that.